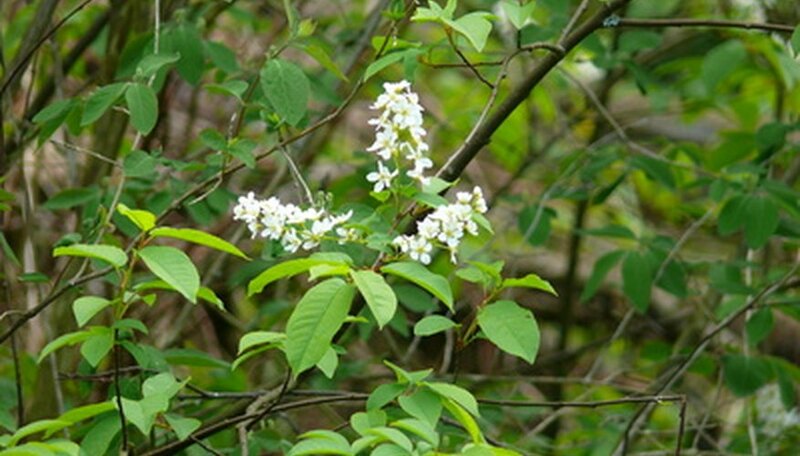 Fire cherry trees (Prunus pensylvanica L.f.), also known as pin cherry or bird cherry, grow in the wild where it provides a valuable food source for birds and wildlife. The name of fire cherry comes from the fact that the tree grows well after forest fires. In fire-ravaged areas, fire cherry trees form stands that provide shade for seedlings of other species. Once the seedlings become established, the cherry trees die off to let the new trees grow. Fire cherry grows in forest clearings, streams and hillsides in the northern U.S. and Canada. In the U.S., the tree thrives south of the Rocky Mountains to Montana and Colorado. The tree also grows southeastward from South Dakota to the Midwestern states including Iowa and Illinois, and on to New England. Fire cherry also grows in the southeast from the Appalachian Mountains south to Georgia and Tennessee. Fire cherry trees reach up to 40 feet high, although the trees typically grow to about 15 feet tall. The plant resembles a bush more than a tree with sharp-pointed, smooth leaves up to 5 inches long growing on glossy, reddish branches. Flower buds form in August or September of the preceding year with the white flowers blooming at the same time as the leaves emerge in the spring. As the flowers fade, they leave tiny green fruits that ripen in August or September into edible, pale-red cherries. Fire cherry trees spread through the seed inside the fruits. While some of the seeds fall to the ground, birds also play a role in dispersing the seeds to locations farther away. The seeds grow best with plenty of light and moisture in fairly open areas, especially in disturbed areas or land ravaged by fire. While fire cherry trees only live for about 30 years, fruit production remains high right to the end. Some gardeners plant fire cherry seeds collected in late summer from the trees or from fruits found on the ground. They plant the seeds in about an inch of soil in the fall. The seeds take months to germinate, allowing them to send up shoots in early spring. Gardeners also rely on transplants obtained from nurseries. Either way, the trees require sunny, well-drained soil and regular watering until the plants become established. The tart, somewhat bitter red cherries require some cooking to make them palatable, although they can be eaten off the tree. The cherries work great in jellies, jams and preserves. The fruits also are used to create cough syrups. A variety of birds and mammals rely on the bitter-tasting fruits of the fire cherry as an important food source. Birds such as robins, bluebirds and grouse as well as bears, raccoons, deer and squirrels eat the fruits. Grouse eat the buds while deer eat the foliage and twigs. Beavers cut down the trees for use building dams and dens. Birds and mammals use the tree as temporary shelter.